In March, Maine Gov. 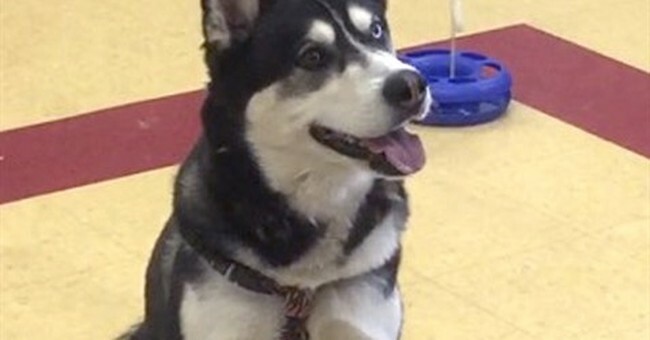 Paul LePage (R) made national headlines for a most unusual piece of legislation: he issued a pardon for a Husky dog, Dakota, that had been sentenced to death. On Monday, it was confirmed that Dakota would be spared death, and instead would only be barred from the city of Waterville, Maine. At a hearing on Monday, the euthanasia order was officially lifted, and Dakota will be trained by a canine behavioral expert. Dakota will also be moved out of Kennebec County. Dakota was ordered euthanized earlier this year after escaping from her yard. This escape was a violation of a confinement order, which her then-new owners were unaware of. When living with her previous (abusive) owners, she killed a smaller dog, and was then prohibited from leaving her house without a muzzle and leash. Afterwards, she was left at the animal shelter as a stray and adopted by new owners, who were not told about the confinement order. People at the Waterville Area Humane Society, where Dakota lived following the euthanasia order, argued that her life should be spared as she was a "model animal" who was not violent. LePage, a dog owner himself, agreed, and issued the pardon. While it was unclear at the time if LePage's pardoning capabilities extended to animals, Dakota will still be allowed to live.